SYNERGY Property Development Services Pte Ltd, a leading project management company based out of Bangalore, India, is eyeing growth opportunities in Asia-Pacific, especially Malaysia. Chairman and managing director Sankey Prasad says Malaysia is one of the few countries in the region that remained resilient during the global financial crisis. “Malaysia showed a lot of stability during the global recession. If you compare with many other markets, this country showed a lot of character and did not suffer any electric shocks of the crisis,” he tells StarBizweek in an interview. “That's a sign of a good and stable market,” Sankey says, adding that Malaysia's resilience throughout the crisis has allowed the country to remain competitive. Sankey started Synergy in early 2003 with just 40 people, and the company has since employed more than 600 people, with a resource pool comprising architects, engineers and project management personnel. Synergy has offices in India (Delhi, Mumbai, Pune, Hyderabad, Trivandrum and Bangalore), Dubai and Malaysia. On the local front, the company operates in Kelana Jaya, employing a team of 25 people. The company offers complete project management consultancy, delivering support and design services through all phases of the development process of a real estate project. It also provides turn-key solutions. In 2008, Blackstone Real Estate Partners, an affiliate of the Blackstone Group (a leading investment and advisory firm), acquired a 35% stake in Synergy. “Our association with Blackstone provides us the expertise of looking at projects that are also attractive from an investment perspective,” says Sankey. “We adopt a holistic approach that provides a single point of contact in every stage of the project, starting from inception to project close-out. This approach is practical in giving a detailed outline of the working procedures,” he adds. Synergy also offers a management information system which is essentially a web portal that allows its customers real-time updates on projects that are being carried out. “The portal can be accessed anywhere and at any time. Using the Internet, our clients can become aware of any issues,” Sankey says, adding that MIS is developed to create more transparency for its customers. The company has delivered over 60 million sq ft of projects consisting developments within the retail, information technology, hotels and hospital sectors. Its clients include Tata, IBM, Goldman Sachs and Deutsche Bank. Having done projects for clients globally, Sankey says Synergy is constantly looking for opportunities, especially within the Asia-Pacific region to help boost its business. Synergy made its foray into Malaysia in 2007, when it became the project manager for MKN Embassy Techzone, a freehold information and communications technology (ICT) business park in Cyberjaya. The project is developed by MKN Embassy Development Sdn Bhd, a joint venture between EMKAY Group of Malaysia and Embassy Group of India. Synergy deals with the pre-construction phase of the project, keeping tabs on the development cost and ensures that it is on schedule. “Cyberjaya has the right infrastructure and the dream ingredients but in the past four years that I have travelled to Malaysia, it has not grown as aggressively as it has been portrayed. Perhaps there needs to be more aggressive marketing on Cyberjaya,” he says. Sankey also says Synergy has recently been appointed project manager for the development of luxury villas at Bandar Enstek, Nilai, in Negri Sembilan. The villas are part of a larger project being developed by a consortium that includes Enstek developer TH Properties Sdn Bhd, Ascenteus Holdings Sdn Bhd and Indian developer, Davanam Constructions. Sankey says ground breaking for the project is expected within six months. Synergy has also secured the right to become project consultants for the development of two international schools one each in Kuala Lumpur and Johor Baru. “We will reveal more when the time is right,” he says. 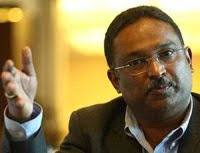 Given Malaysia's growth opportunities, Sankey says Synergy is looking to secure “big” projects. Asked about the challenges in Malaysia, Sankey says getting construction materials is a common issue. On the global front, Sankey says Synergy is cautious about its expansion plans, but adds that the company is looking to offer its services in Mauritius, Indonesia and the Philippines. MALAYAN Banking Bhd (Maybank) is anticipating a take up of RM60 million within the next six months for its latest mortgage facility "Overseas Mortgage Loan Scheme" being offered for those purchasing properties in London. "This is in view of attractive property valuation in London and overseas buying interest to peak before April 2011 when the new 5 per cent sales tax is imposed for properties above STG1 million (RM4.84 million)," Maybank deputy president and head of community financial services Lim Hong Tat said in a statement yesterday. The key features of the mortgage scheme include repayment in ringgit, high margin of financing of up to 85 per cent, flexible repayment and long tenure of up to 30-years or 70-years of age, whichever is earlier. The facility will be offered in the form of term loan, overdraft or a combination of term loan and overdraft, he added. The ringgit mortgage facility will finance completed or under-construction residential and commercial properties in London Zone 1 to Zone 3, covering prime locations such as the City of London, Westminster, Knightsbridge, Kensington and Chelsea. Maybank's mortgage facility makes it the first Malaysian bank to offer Malaysians a local mortgage loan facility in ringgit for purchase of property in London.